I won't even pretend like I know what it was like to be an African-American in the south in the 1960s. There have been so much written and shown about the history of racism in America; it's our collective, terrible shame and it still exists in many forms. Set during this time, “Hidden Figures” a delightful new drama that highlights some of the real life African American women who were critical to the US space program. Think “The Help” meets “Apollo 13.” It's the mash-up we never thought we needed, but here it is, and it's a sheer joy from start to finish. Finally we get well-drawn African American main characters who aren't maids, slaves, abusive parents, drug dealers, or criminals; and they're way smarter than you or me. “Hidden Figures” is a standout fact-based tale about really essential people who many don't know existed. It has an amazing ensemble cast and highlights an important time in our country's history that still feels relevant today. The film is a crowd-pleaser of the highest order. Take your mom; she's definitely gonna want to see this one. First it must be said. If you're expecting some kind of revolutionary piece of artistic filmmaking look elsewhere. If you want a more challenging or flashy piece of art you should definitely seek out the many other films this year has to offer, especially “Moonlight.” “Hidden Figures” is much more lightweight, and fun, though it does deal with a very serious and disturbingly real time in our country's history: the segregated South. Let's face it, segregation was disgusting. The film makes no bones about it nor refuses to show how real the “separate but equal” treatment of blacks in the south in our country. And thankfully the lighthearted tone doesn't detract from the seriousness of the issues; this isn't a Disneyfied version of American racism. It's almost unfathomable that the film's characters could get an education that would even remotely get them close to working for NASA. They certainly were pioneers. 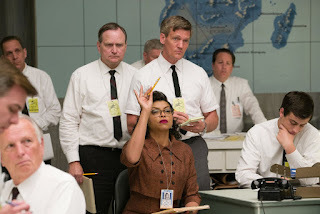 There's Katherine G. Johnson played wonderfully by Taraji P. Henson. She's a brilliant mathematician and the film's opening scene shows her as young girl capable of solving math problems way advanced for her. Katherine's brilliant friends Dorothy (Octavia Spencer) and Mary (Janelle Monae) also work for NASA with a bunch of Black women in the Langley Research Center's West Area Computers division in the early 60s. You may think these women have the life working for NASA but most of their white co-workers still looked down on them because of the color of their skin. Katherine gets promoted to the Flight Research Division where she eventually gets to help engineers with the first manned missions to outer space while in a space race with Russia. Of course there are bumps along the way but luckily the group's director played by Kevin Costner is a pretty decent guy. Are the rolex replica sale with black dial, two tone with chrome or just solid steel, and which ones comes with diver extension. Please if you specify. I am looking for a solid silver cartier replica sale submariner with black dial with date with a diver extension. Please let me know which one to buy. Now it's time the actual metal rolex replica uk obtained a good update, because it has been regarding 16 many years because we have observed this rejuvenated. The actual wait around has ended using the replica watches sale research 116500LN within 904L metal. This runs on the brand new monobloc tag heuer replica sale within dark ceramic by having an up-to-date tahcymeter style, losing the actual old etched steel bezel. It is nevertheless obtained the actual calibre 4130 motion, however has become examined through replica watches sale in order to mere seconds daily precision, that is extremely amazing for any produced in higher quantities chronograph.